We made this disclaimer for all our visitors to realize what this blog is all about and why we exist or why people visit us. 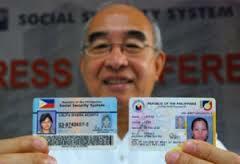 We do not imitate any website, we are our own identity being a resource of information regarding Social Security System in the Philippines as well as other parts of the world. This blog or its author/s are not related to any official or employee of the SSS (Social Security System) or its different websites from other countries and branches or any government official in the Philippines or other countries being discussed. We simply exist because of the need for easy to access information with matters of the SSS / SSA and social security thru online information as well as for airing of grievances and problems by SSS members. This being the case, we are against any form of hate so we expect that you express your opinion in a nice manner thru our comments section. We reserve full and absolute right to delete any comment we feel violates our disclaimer or purpose of helping the service improve for the better of all parties. The contents, images, photos, pictures and information found on this website are not ours unless otherwise specified and mentioned in our posts. If you are an owner of anything you find here and would like your content, images,photos, pictures or information removed from our blog, please e-mail us or leave a comment on the content you wish to be removed.